Davies Bakery is a family owned business. The family has been in the baking industry for over 125 years. Their founder John Davies was known as a conscientious, generous and hardworking man, with a passion for high quality bread. Today, they are 5th generation bakers and one of the largest independent bakeries in Australia. With a modern manufacturing plant, they are capable of producing large volumes of high quality, fresh and frozen bakery products. They thrive on baking bread and pastries which are full of flavour and are persistent in their pursuit of continuous improvement. A state-wide, fresh-daily, distribution network and their reputation for superior service, means that they are known for their reliability. This is why they supply some of Australia’s largest companies. No matter how hard you try, it’s sometimes the traditional way to make something that’s just the best way. In the case of Davies Bakery, the classic recipes result in delicious breads like a light rye or rustic grains. The packaging for the loaves, designed by makebardo, respects the history and tradition of bread-making but also stands out on the shelves with bright colors. Davies Bakery makes fresh bread that has no artificial colours, flavours, or preservatives — just like you would have found years ago when recipes were kept simple. 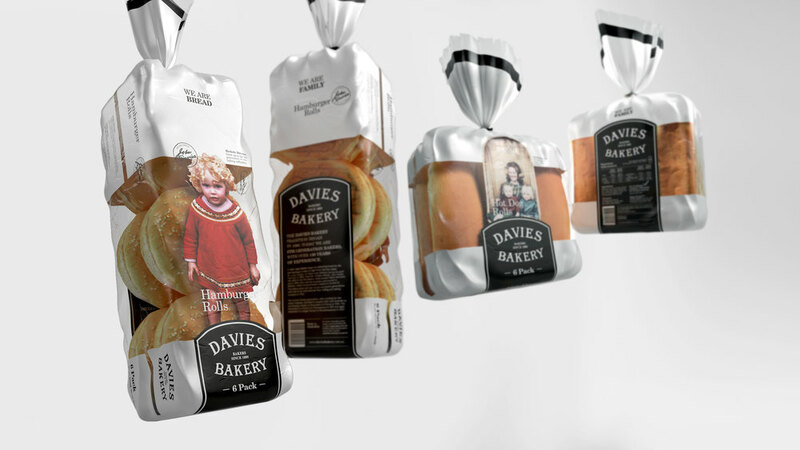 Black and white photos of first generation bakers appear on the front of the packaging, and a write-up on the back of the packaging explains that Davies Bakery has been in business since 1880. This builds immense trust with the buyers and communicates the pride that Davies Bakery feels about its products. Each type of bread has a corresponding colour of the rainbow which pops against the rest of the black and white packaging. Even with a standard serif font, these vibrant hues give Davies Bakery a modern appeal. We are proud because sales have notably improved since introduction of the new packaging. This is a great example of how design ‘thinking and doing’ produces real business results.